Here at Museum Tower Dallas, our residents enjoy the finer things in life. From unparalleled service to gourmet cuisine, everyday is never just the same day. Last night, several gracious Museum Tower Dallas homeowners opened their spectacular residences for an intimate and special experience, "Progressive Dinner and Cocktails." Beginning in the spacious Terrace Lounge, our residents visited four beautiful homes enjoying refreshing libations and outstanding fare from the menu of the talented Chef Jaco Smith of The Joule. 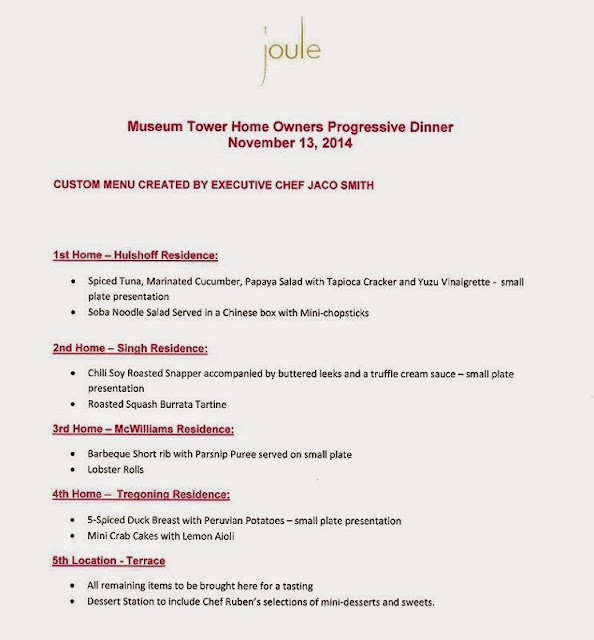 Museum Tower Dallas was, as always, delighted to host Chef Jaco Smith and extends sincere thanks to him for sharing his culinary artistry. With smiles and laughter all around, it was one of many spectacular evenings to take place at Museum Tower Dallas and a wonderful start to the holiday season. Home to a genuine community of friends in the center of an extraordinary city, life at Museum Tower Dallas is truly above the rest. In the words of Mae West, "You only live once, but if you do it right, once is enough." And, at Museum Tower Dallas, we most certainly do. Take the opportunity to make the most out of life with us today.